A new survey finds an increased number of Americans are saying Jews face discrimination in the United States. Sixty-four percent of Americans say Jews face at least some discrimination, an increase of 20 percent from 2016, Pew reports. Twenty-four percent say Jews face "a lot" of discrimination, while only 13 percent said the same in 2016. In 2016, 15 percent of Democrats and 9 percent of Republicans said Jews faced a lot of discrimination; those numbers increased to 28 percent and 20 percent, respectively, in 2019. Vice President Mike Pence warned that anti-Semitism is alive and growing in the United States and around the world during a tour of the Auschwitz Nazi concentration camp in February. The vice president said dark days like the Holocaust begin "with vile rhetoric." 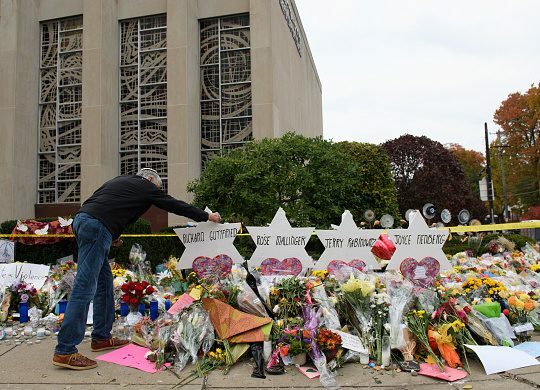 Last October, a gunman yelling, "All Jews must die," killed 11 worshipers and wounded several others at a synagogue in Pittsburgh. A report from last summer found anti-Semitic incidents on college campuses in the United States grew in 2018, with almost 400 incidents recorded in the first half of last year. Democrats have struggled with accusations of anti-Semitism within their party. In February, Rep. Ilhan Omar (D., Minn.) said she wanted "to talk about the political influence in this country that says it is okay for people to push for allegiance to a foreign country." Omar doubled-down on her comments after receiving criticism, prompting Democratic leaders to scramble to write a resolution condemning various forms of hatred. A month prior, Omar apologized for anti-Semitic tweets, many of which were later quietly deleted. She has also had to walk back a tweet in which she accused Israel of hypnotizing the world and performing evil acts. Rep. Rashida Tlaib (D., Mich.) was criticized in January after she accused senators supporting an anti-BDS bill of having "forgot[ten] what country they represent." This entry was posted in Issues and tagged Anti-Semitism. Bookmark the permalink.